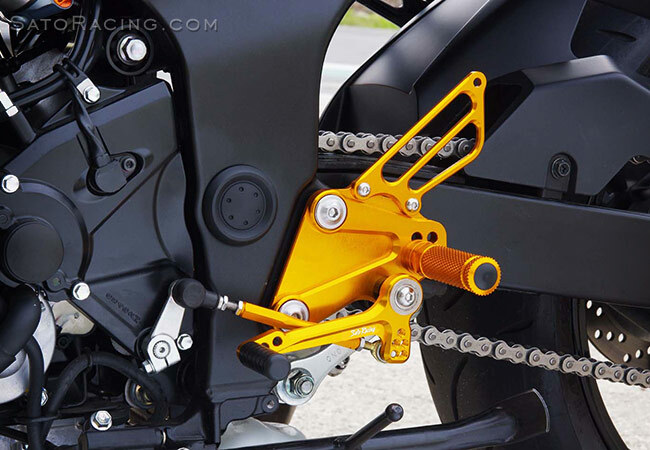 SATO RACING Rear Sets for 2015 and up Suzuki GSX-S750 series ( along with non-U.S.model GSR750 ) are a track-engineered design, CNC-machined from high strength billet aluminum with your choice of Black, Silver (clear metal), or vivid Gold anodized finish. 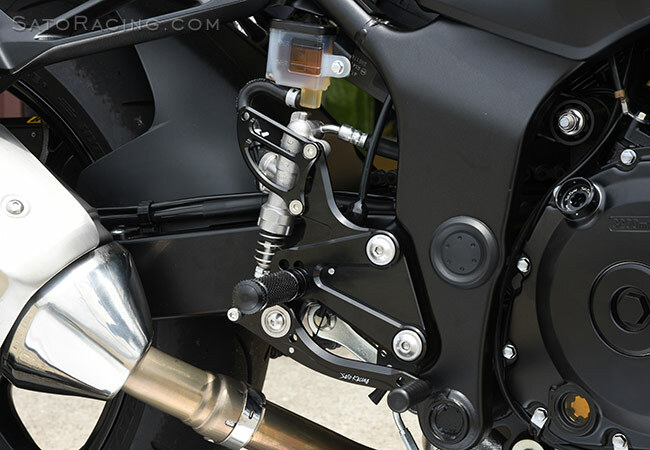 Provides 4 adjustable peg positions that bring your feet progressively higher up and further back compared to stock, for a more sportbike-like position that is ideal for spirited riding. Can be set up for either stock shift pattern or reverse shift pattern; Just flip the stock shift arm the opposite direction. Compatible with both ABS-equipped and non-ABS GSX-S750 models. 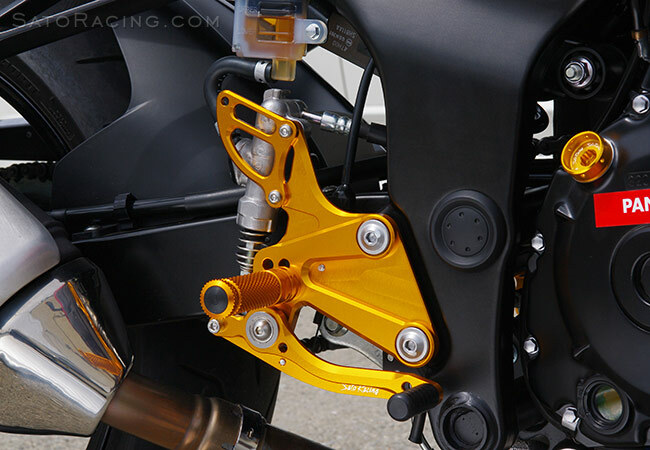 Note: The following photos show these Rear Sets installed on a 2012 and a 2015 GSR750 (Japan model). 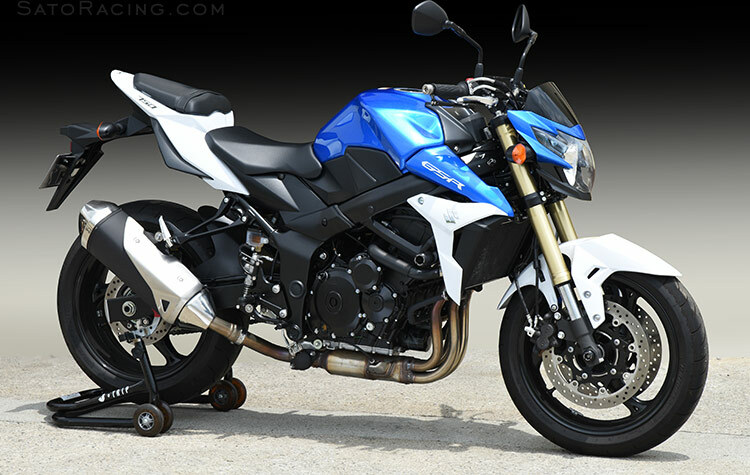 The US market GSX-S750 is similar. 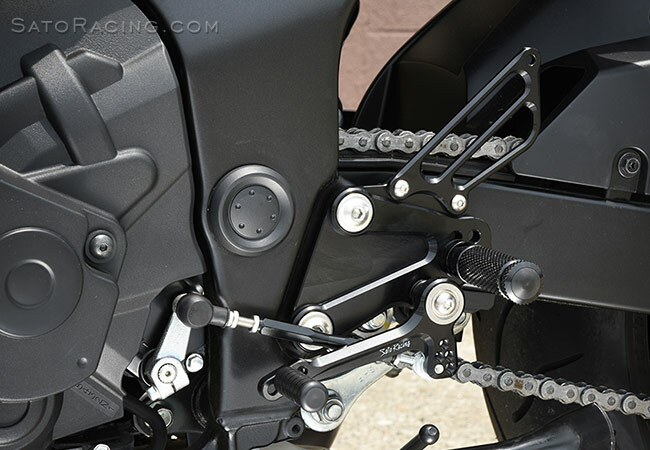 The Foot Peg position is adjustable 4 ways. The Pedal Tip position can also be adjusted. 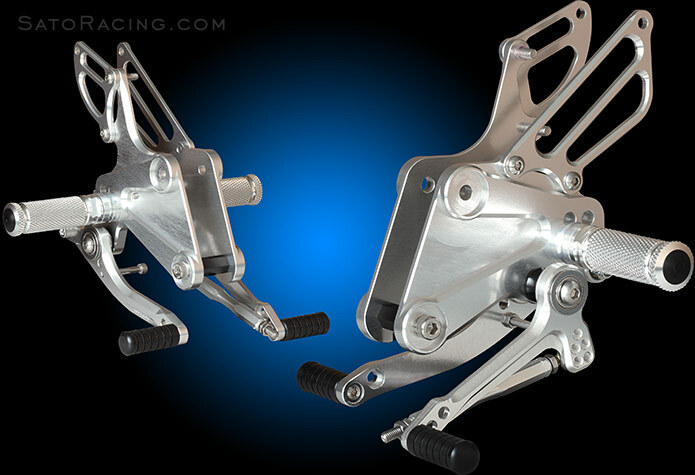 SATO Rear Sets are available in either Black, Silver (clear metal) or Gold anodized finish. hardware, so you won't need to splice in an aftermarket brake light switch. You can switch to GP-style reverse shift pattern by flipping the stock change arm. 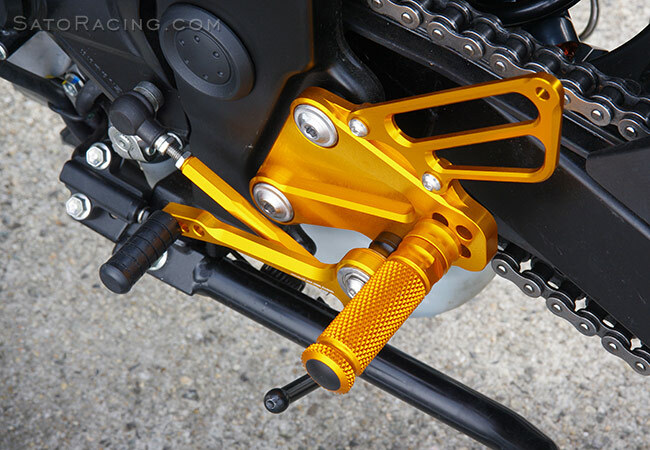 These Rear Sets are designed for use with the stock Suzuki shift arm and rod end, (as seen in these photos). 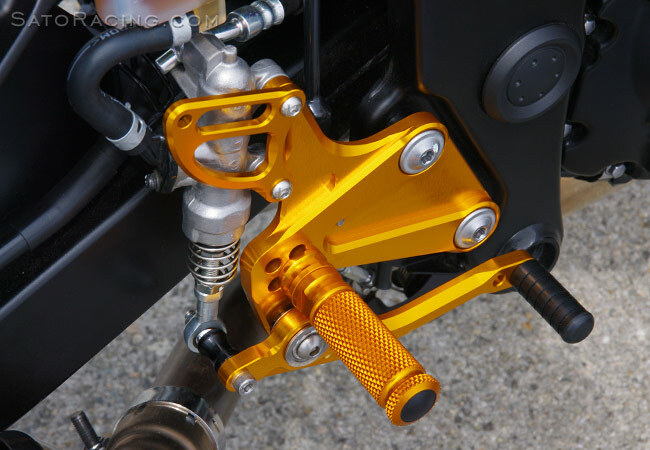 We now also make an adjustable billet aluminum Shift Arm kit (part# S-CA2) that works well with these Rear Sets, providing additional adjustment options for the shift linkage. 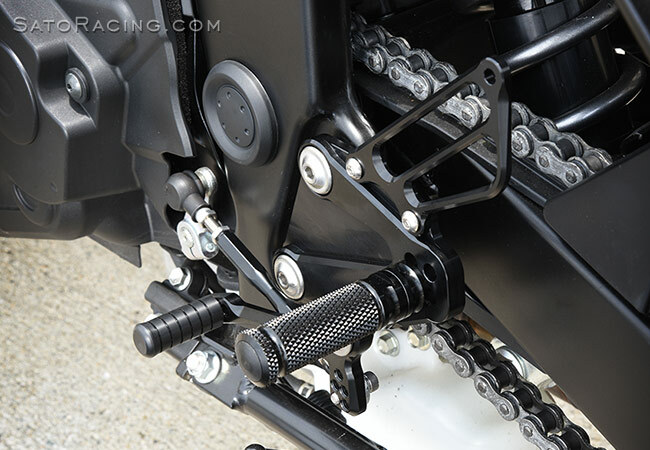 Our GSX-S750 Rear Sets are designed to utilize the stock bolts to attach the step plate to the frame. 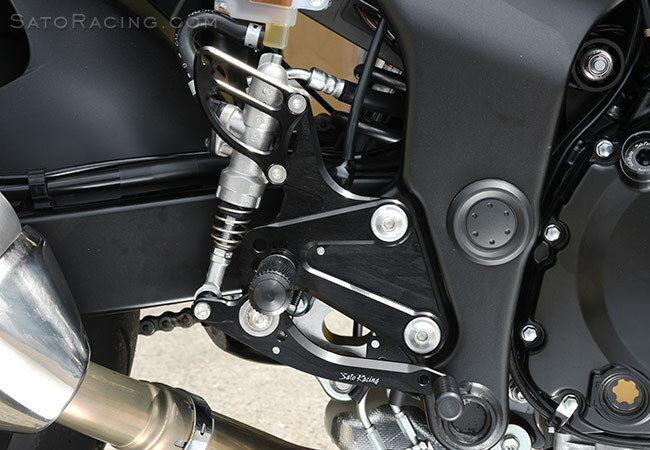 The clean, angular styling of these Rear Sets blends seamlessly with the lines of the bike. Foot Pegs have a finely knurled pattern for non-slip grip and a comfortable feel.